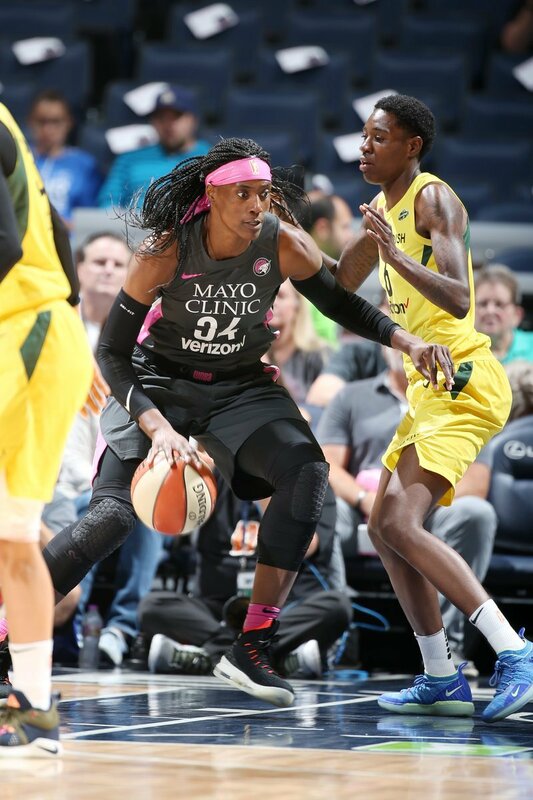 Sylvia Fowles, left and Natasha Howard were the high scorers for their respective teams with 28 and 21 points, respectively. Seattle Storm photo. 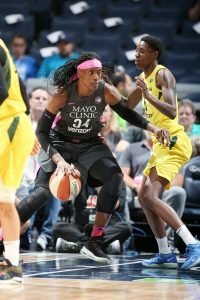 Minneapolis – Playing in the finale of a four-game road trip, the Seattle Storm walked out of Target Center Sunday with a convincing win over the Minnesota Lynx, 81-72. It was the first win at the arena for Seattle since 2010. Led by 21 points from Natasha Howard and 17 points and 17 rebounds from Breanna Stewart, the top-seeded, 24-8 Storm took advantage of the injury-depleted Minnesota lineup by outrebounding their opponents and shooting 44 percent from behind the arc. Seattle was routed by the Washington Mystics three days earlier, which snapped a five-game winning streak. Storm coach Dan Hughes said he was pleased at at the way his team responded against the defending champion Lynx. Seattle looked the part of the league’s best team from the opening tip as Howard got the team on the board early and the Storm jumped out to an early 7-2 lead. The Lynx were short-handed as starting forward Rebekkah Brunson is out with a broken nose, and reserve point guard Danielle Robinson sat with a high ankle sprain. Minnesota’s new starting lineup – Maya Moore, Sylvia Fowles, Tanisha Wright, Seimone Augustus and Cecilia Zandalasini – was able to keep the game relatively close near the end of the first quarter, tying it at 11 before the Storm finished on a 6-2 run. The hosts kept the game close in the second quarter and part of the third, but like many games in this disappointing season for the 17-14 Lynx, their energy lagged in at the end of the game, which allowed Seattle to pick their spots to attack and create opportunities. Stewart and Howard traded baskets for much of the game, and while they couldn’t contain Fowles, who scored a team-high 28 points and grabbed 13 rebounds, the Lynx weren’t able to make enough defensive stops when it counted. Moore put up all of her 12 points in the first and second quarters, and didn’t score a point or tally a rebound in the second half after two straight games of 30 or more points. Seimone Augustus added 13 points. Lynx coach Cheryl Reeve attributed the loss to her team’s defensive lapses. The Storm need just one more win to lock up a No. 1 seed for the playoffs, which would give them two byes. Minnesota’s loss, coupled with a Mercury win, drops the Lynx to seventh place. Minnesota clinched a playoff spot Thursday, and close out the regular season with games against the Chicago Sky, Connecticut Sun and Washington Mystics. Seattle only has two more games, against the flagging New York Liberty and Dallas Wings.